Acute respiratory distress syndrome (ARDS) is common in critically ill patients admitted to intensive care units (ICU). ARDS results in increased use of critical care resources and healthcare costs, yet the overall mortality associated with these conditions remains high. Research focusing on preventing ARDS and identifying patients at risk of developing ARDS is necessary to develop strategies to alter the clinical course and progression of the disease. To date, few strategies have shown clear benefits. One of the most important obstacles to preventive interventions is the difficulty of identifying patients likely to develop ARDS. Identifying patients at risk and implementing prevention strategies in this group are key factors in preventing ARDS. This review will discuss early identification of at-risk patients and the current prevention strategies. Acute respiratory distress syndrome (ARDS) is common in critically ill patients admitted to intensive care units (ICU). Previous studies support a two-hit model of ARDS development in which exposure to pertinent risk factors modifies the development and expression of ARDS in a host with predisposing conditions [1–3]. However, beyond the development of ARDS in a susceptible host, theories of the pathogenesis of this condition should explain progression from an initial lung injury to mild ARDS or from mild or moderate to severe ARDS. To this end, a chain reaction based on multiple hits can be involved in the pathogenesis of ARDS development and/or the progression of severity . Host predisposing conditions act as a first hit in healthy lungs, where multiple hit can induce ARDS. In the absence of these predisposing conditions, the probability that the other hits would result in ARDS is lower. 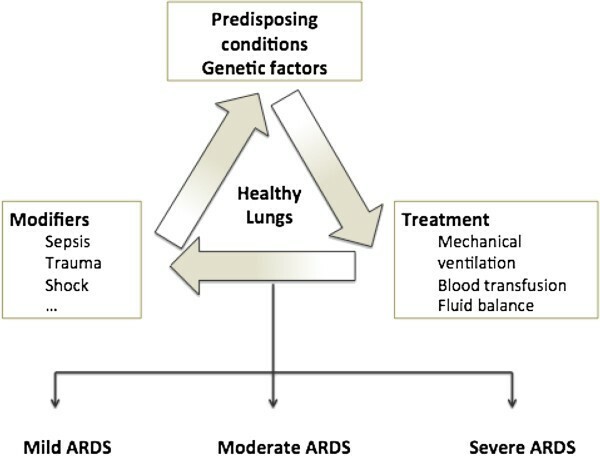 Whether the disease progresses from an initial injury to ARDS or continues to progress from mild-moderate ARDS to severe ARDS probably depends on a chain reaction based on these multiple hits (Figure 1). Multiple-hit model. A chain reaction of predisposing conditions and multiple hits (modifiers factors and treatments) in healthy lungs can develop mild, moderate or severe ARDS. Hudson et al. found the presence of one or more of eight clinical conditions (sepsis, aspiration, drug overdose, near-drowning, pulmonary contusion, multiple transfusions, multiple fractures, head trauma) predicted whether ARDS develops with 79% sensitivity but only 26% specificity. Fowler et al. found pneumonia, aspiration, and disseminated intravascular coagulation were the strongest predictors but only 7% of the patients with one or more predisposing factors developed ALI. Gong et al. showed the risk of ARDS increased with a pulmonary etiology of injury, hematologic failure, transfusion of eight or more units of packed red blood cells, respiratory rate > 33 breaths/min, hematocrit > 37.5%, arterial pH < 7.33, albumin ≤ 2.3 g/dL, and transfer from another hospital. In another study in non-ICU hospitalized patients, Ferguson et al. found that pulmonary risk conditions had a higher rate of progression to ARDS than nonpulmonary conditions, but shock was the strongest predictor. Therefore, by halting this unvirtous circle might help to stop the progression to ARDS. The first obstacle to preventing ARDS is identifying patients at risk of developing ARDS . Many authors have proposed clinically detectable predisposing factors and even scores to identify patients at risk early in the course of the disease. Implementing preventive measures requires an algorithm for early detection. Different algorithms have been proposed. Trillo-Alvarez et al. developed an ALI prediction score, the lung injury prediction score (LIPS), that identifies patients at high risk for ALI before ICU admission. Risk factors are divided into predisposing conditions (sepsis, shock, pneumonia, aspiration, trauma, and high risk-surgery) and risk modifiers (obesity, alcohol abuse, diabetes, hypoalbuminemia, acidosis, tachypnea, and oxygen supplementation). Gajic et al. validated this score in a prospective, multicenter, observational study, demonstrating that the LIPS model discriminates efficiently between patients who have a low risk of developing ARDS and those with high risk (AUC = 0.8), while maintaining an appropriate sensitivity for screening (negative predictive value (NPV) = 0.97). In 2010, Thakur et al. reported a cohort study designed to identify patients at risk early before ARDS develops, using an electronic medical record that facilitates early recognition of specific criteria, based on a previously validated ARDS sniffer (NPV = 0.99, 95% confidence interval (CI) 0.98-1.00) . They identified patients at risk by the LIPS score and recorded hospital-acquired exposures that may modify the risk of ARDS and its impact on subgroups of high-risk patients. Levitt et al. proposed the term “early ALI” (EALI). EALI identified patients progressing to ARDS with a sensitivity of 73% and a specificity of 79%. The combination of early clinical recognition and predictive scores could help in the detection of patients at-risk and in the early treatment or implementation of preventive strategies. Identifying a biomarker that predicts the development of ARDS or progression of severity could be helpful. The ideal biomarker would be easy and safe to collect, easily measured and reproducible, highly sensitive and specific in predicting clinical outcome, and have a defined role in the pathogenesis of ARDS . Unfortunately, no single biomarker is currently specific or sensitive enough to be incorporated into routine clinical practice. Volatile organic compounds in exhaled air may differ between diseases. Bos et al. [16, 17] conducted two studies where they discriminated between mechanically ventilated patients with and without ARDS on the basis of a breathprint obtained by analyzing exhaled air through eNose technology. This breathprint distinguished between patients with ARDS and those without as accurately as PaO2/FiO2 assessment. Noninvasive analysis of exhaled air may help to identify a biomarker to detect ARDS in an early stage, before clinical signs; however, further studies are needed before this approach can be incorporated into routine clinical practice. Other biomarkers in plasma or bronchoalveolar lavage fluid have been studied in patients with ARDS. A recent trial in critically ill patients demonstrated that higher levels in plasma of angiopoetin-2 were significantly associated with increased development of ALI (odds ratio (OR) 2.4; 95% CI 1.3-4.2) . Furthermore, the association of angiopoetin-2 levels and the LIPS improved the AUC to 0.84. Because there is no ideal biomarker to help us in the early detection of ARDS, the association between biomarkers and different scoring systems based on clinical data or diagnostic tests could improve prediction scores [19, 20]. There is some evidence that genetic factors predispose to the development of ARDS and poor prognosis. Copland et al. used an experimental model of acute ventilator-induced lung injury (VILI) to determine which genes changed their expression depending on inspiratory volumes, and they identified various genes with overexpression. One of the most important studies is from Grigoryev et al. , who identified 85 genes important in the pathogenesis and different biologic processes involved in the development of ARDS. Nevertheless, at present, we cannot identify a single gene responsible for a high susceptibility to ARDS. Some studies are currently trying to evaluate the role of single nucleotide polymorphism (SNPs) and haplotypes in order to better detect patients at ARDS risk. These studies could help to define new therapeutic targets, new approaches to treatment, and individual indicators of predisposition to developing the disease that might enable the development of effective preventive strategies. Defining risk factors associated with the development of ARDS in patients with an infectious disease is challenging because virulence factors of different pathogens have been implicated in causing lung damage. Bacterial products are directly toxic to the lung epithelium, independent of host inflammatory responses and other factors . Kojicic et al. recently found that the risk of hospitalized patients with infectious pneumonia developing ALI varied with the pulmonary pathogens. Beyond the etiology, certain modifiable external factors can accelerate the development of ARDS. Lung protective ventilation Lung-protective mechanical ventilation strategies are the only supportive therapy that clearly improve survival in patients with ARDS. However, mechanical ventilation can lead to lung injury by different mechanisms, with subsequent diffuse alveolar damage, pulmonary edema, and local production of inflammatory mediators. This circumstance is known as VILI. Tremblay et al. showed that mechanical ventilation with high volumes and without positive end-expiratory pressure (PEEP) could increase tumor necrosis factor (TNF-alpha) and interleukin-6 (IL-6) concentrations in bronchoalveolar lavage fluid, whereas cytokine levels are lower if protective mechanical ventilation is used. Amato et al. demonstrated lower mortality in patients ventilated with a limited tidal volume to avoid overdistension. A prospective, multicenter trial (ARDS Network) published in 2000 confirmed that mechanical ventilation with lower tidal volume (6 mL/Kg predicted body weight (PBW)) resulted in an increase in the number of ventilator-free days and a reduction of in-hospital mortality . Mechanical ventilation is an important factor in the treatment of ARDS, but is it important in prevention? Does mechanical ventilation work as a risk modifier in patients at risk? Could we help to prevent the development of ARDS by applying protective mechanical ventilation in patients at risk? In a recent study, our group found that septic patients without ARDS ventilated with a protective strategy using a plateau pressure < 30 cmH20 had better outcomes and a lower incidence of ARDS than those ventilated without this limit on plateau pressure . Thus, it may be beneficial to implement protective ventilation strategies from the start of mechanical ventilation, not only when ARDS appears. It remains to be determined whether only plateau pressure should be targeted or whether tidal volume should be targeted too. In our opinion, preventive strategies also should include protective ventilation with low tidal volume in patients at risk, and some studies support this approach. In 2004, Gajic et al. reported that in ventilated patients without ARDS large tidal volumes (11.4 mL/kg PBW for women and 10.4 mL/kg PBW for men) were independently associated with the development of ARDS. In a prospective trial, Determann et al. randomized patients who required mechanical ventilation to receive low tidal volume (6 mL/kg PBW) or conventional tidal volume (10 mL/kg PBW); the trial was stopped prematurely because more patients in the conventional tidal-volume group developed ARDS than in the lower tidal-volume group (13.5 vs. 2.6; p = 0.01). Interestingly, the use of protective ventilation in “healthy lungs” seems to be a field for further research. A recently published meta-analysis, including eight trials that evaluated two types of mechanical ventilation in patients with uninjured lungs in the operating room, demonstrated a decrease in lung injury development, pulmonary infection, and atelectasis using lower tidal volumes and high PEEP . These results support the previous meta-analysis that demonstrated only an attenuation of the development of lung injury, conducted with trials that included patients in operating room and ICU . No concrete ventilation strategies have been established for patients without ARDS who require mechanical ventilation. We think that ventilation with low tidal volumes and plateau pressure < 30 cmH2O is a reasonable prevention strategy of ARDS. Side effects associated with low tidal volumes seem to be minimal. However, based on a review by Schultz et al. , most studies favoring low tidal volume ventilation in patients without ARDS measured inflammatory mediators instead of clinical outcomes, so prospective trials should be done to evaluate the clinical impact of this ventilatory strategy. The use of prophylactic PEEP in patients without ARDS is controversial. Various authors have demonstrated that prophylactic PEEP decreases the incidence of ARDS and PEEP may protect the lung after different types of insults. In the 1970s it was demonstrated that intraoperative use of PEEP reduced ARDS development  and the use of early prophylactic PEEP reduced the incidence of ARDS . Other studies demonstrated that the use of certain amount of PEEP reduced the intensity of lung injury from different aggressions, as Dreyfuss et al. showed in 1988 with the reduction of edema and preservation of the normal structural aspect of alveolar epithelium using high levels of PEEP [36, 37]. However, other studies have refuted this effect. Pepe et al. conducted a trial where found that the early application of PEEP in high-risk patients had no effect on the incidence of ARDS . Manzano et al. conducted a randomized trial where nonhypoxemic patients without lung injury received 5 cmH2O or 8 cmH2O PEEP versus no PEEP. They found no differences between groups in the development of ARDS, but the proportion of patients who developed hypoxemia was significantly higher in the no-PEEP group and the PEEP group developed less ventilator-associated pneumonia (relative risk (RR) 0.37; 0.15-0.84). The use of higher tidal volumes, based on older strategies, arose from a need to prevent atelectasis. PEEP strategies are now better understood and the risk of over distension better appreciated. So, this need has lessened. Fluid balance is an important risk modifier in the development of ARDS. Pulmonary edema is largely due to increased capillary permeability but is exacerbated by increased hydrostatic pressures and oncotic pressure falls . The first reports about fluid strategies date from 1987, when Simmons et al. observed that outcomes in ARDS patients were better if they lost body weight and had a lower fluid balance. Sakr et al. in a cohort observational study showed that a higher mean fluid balance was independently associated with increased mortality in patients with ARDS. In 2006, the ARDS Network published the results of a prospective, randomized trial comparing conservative and liberal fluid strategies in patients with ARDS. The authors included patients after 48 hours of ICU admission and with systolic blood pressure > 60 mmHg. The primary outcome (60-day mortality) did not differ between groups, but the conservative group had better oxygenation index and lung injury scores, as well as more ventilator-free days . A limitation of this study is the exclusion of hemodynamically unstable patients that difficult the generalization of the results to all patients with ARDS. On the other hand, Murphy et al. showed in a retrospective analysis of patients with septic shock and ARDS that an adequate initial fluid resuscitation during the first 2 consecutive days coupled with conservative fluid management after that was associated with the lowest mortality. Despite the above, no randomized trials have been done evaluating a two-phase fluid management strategy that could confirm this strategy. Thus, in patients with established ARDS, it seems that a conservative fluid strategy should be used, but it is difficult to know the role of fluid balance in the absence of ARDS. Sepsis precipitates ARDS in 25% to 40% of cases, and the risk increases if a systemic inflammatory response, shock, or organ dysfunction is present. The most frequent etiology is pneumonia, followed by nonpulmonary infections . There is no specific preventive treatment against the development of ARDS in patients with sepsis. Novel therapies are being studied, but no promising results have been reported. It seems that early detection of patients with sepsis who are at risk of developing ARDS is one way to achieve better results in the earliest phase. 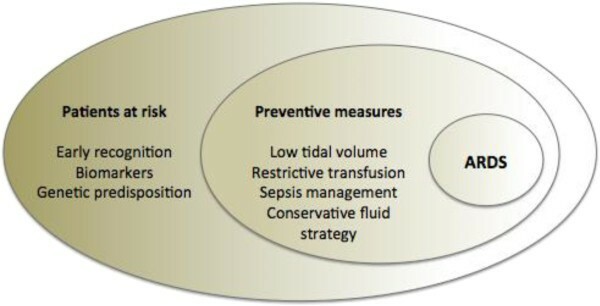 Indeed, one of the most important preventive strategies is to ensure adequate management of sepsis, including source control and early appropriate antibiotic therapy [46, 47]. Several studies have demonstrated an association between the transfusion of blood products and ARDS. Zilberberg et al. showed that more patients who developed ARDS had received red cell transfusions than those who did not develop ARDS; moreover, they found that transfusion of greater amounts increased the risk of developing ARDS. Many authors have since confirmed this association [7, 45, 49, 50]. Transfusion-related acute lung injury (TRALI) is defined as new ARDS during or within 6 hours after an infusion of one or more plasma-containing or plasma-derived blood products . The neutrophil has been postulated that is the responsible cell in the pathogenesis of TRALI. In 1985 Popovsky et al. published a sequence of patients who developed TRALI after blood transfusion and demonstrated the presence of leukocyte antibodies and antibodies anti-HLA in a high percentage of blood donators. It was thought that donors’ antibodies were responsible of TRALI, but some transfused patients did not develop TRALI despite the presence of leukocyte antibodies . Silliman et al. proposed a nonimmune model based on two hits: first, a lung injury in the lung epithelium causes sequestration of neutrophils in the lungs, and second, the transfusion of blood storage causes liberation of cytotoxic factors and capillary damage. This concept is because blood storage products are correlated with a high development of transfusion reactions, and factors responsible of these reactions increase with time of storage . The activated neutrophils release oxygen radicals and other elements that damage the lung endothelium. Despite this, there are clinical and experimental evidence of TRALI without neutrophil primo activation, but it is the underlying disease that activates the endothelium and after that neutrophils are recruited in lung capillaries. These theories of pathogenesis suggest different preventive strategies. Several studies have demonstrated worse outcomes after donation from multiparous women, because the likelihood of HLA and HNA immunization increases with the number of pregnancies [54–56]. Because of this, many authors suggest the restriction of women donors [57–59]. Although it could seem disproportioned, the option of the screening of donors is expensive and not available in all sites. The strategy of reduction the time of blood storage seems reasonable to prevent nonimmune TRALI. Another option is the leukoreduction, reducing the activity of preactivated neutrophils. It has been introduced in many countries . An adequate policy of transfusion focused on less transfusion is perhaps the most important preventive strategy . Many trials are underway to test whether different pharmacologic treatments have beneficial effects, but many pharmacologic therapies that prove effective in animal models fail in human studies. To date, there is no specific pharmacologic treatment for the prevention of ALI/ARDS. Activated protein C (APC) has several anti-inflammatory effects that may reduce the likelihood and severity of lung injury. In ARDS, acute inflammation in pulmonary compartments is characterized by fibrin formation, cytokine production, and protein leakage into the alveolar space due to increased capillary barrier permeability and neutrophil migration. All of these are potential targets of recombinant human APC. Local administration of APC would be a good treatment strategy in ARDS, avoiding the bleeding complications associated with systemic administration. It might be feasible to administer APC to ARDS patients by inhalation. Administering inhaled APC to mice significantly reduced lipopolysaccharide-induced pulmonary inflammation . Another experimental study tested the preventive effect of inhaled APC against lung injury in mice and found a reduction in lung injury induced by mechanical ventilation in the group that received inhaled APC . Nevertheless, the evidence supporting the use of APC is not strong enough to recommend it for the prevention of ARDS. We need more studies. Recent studies using experimental models of ALI have demonstrated that the transplantation of mesenchymal stem cells (MSCs) improves the regeneration of lung tissue . The benefits MSCs are derived not only from the incorporation of these cells in the damaged lung, but also from their interaction with damaged lung cells and immunologic modulation. Most of these studies administered MSCs as a pretreatment; one study in rats showed pretreatment with MSCs reduced VILI . However, the use of MSCs is still highly experimental and more studies are necessary before they can be applied as a treatment or prevention strategy. Aspirin, statins, inhaled corticosteroids, and beta-2 adrenergic agonists have been tested in experimental studies but have yet to show promising results in human patients. More studies are necessary before these drugs can be incorporated into preventive strategies . Although there is still a long way to go in the ARDS prevention field, some new strategies and preliminary studies promise to improve the early identification and early intervention to prevent the progression of the disease (Figure 2). ARDS is a common and devastating complication after acute illness or injury, and it results in high morbidity, mortality, and healthcare costs. Lung-protective ventilation and appropriate sepsis management seems to be the only strategies proven to improve outcomes in ARDS patients; preventive strategies are a new field of research aiming to avoid the progression of the disease. To date, few preventive strategies have shown clear benefits. The combination of early clinical recognition and predictive scores could help to identify patients at risk and those who might progress to mild, moderate, or severe ARDS. The titration of tidal volume and the duration of mechanical ventilation in patients without ARDS seem to be the best strategy for prevention.